The daring neologism “wetware” proved to be the most apposite term to coalesce the intermedia work of nine international artists affiliated with bioart into one exhibition. Bioart is the field of creative expression in which artists use living matter – cells, bacteria, embryos, plants, flesh, and more – to make works of art, installations, and performances. 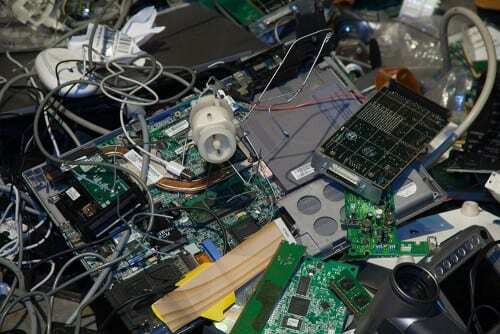 Like the art it described at the Beall Center for Art + Technology at the University of California, Irvine, the word “wetware” is at once specific and suggestive, capacious while difficult to pin down. Not to be confused with hardware, software, or meatware—the last being its closest variant—wetware names the interface between the biological and mechanical that makes uneasy, blurry distinctions between the living and nonliving, the natural and artificial, and the animate and inanimate. The fluidity of this crossing point lies at the center of Wetware: Art, Agency, Animation, an exhibition cocurated by Jens Hauser and David Familian, with work by Adam Brown, Gilberto Esparza, Thomas Feuerstein, Klaus Spiess and Lucie Strecker, Orkan Telhan, Evelina Domnitch and Dmitry Gelfand, and Anna Dumitriu. Similar to “biomediality,” Hauser’s word for the convergence of “hard, soft, and wetware,” the exhibition was motivated by the merging of fields, epistemologies, and materials.1 The greater field of biology within art is based on a fusion of many fields, the most central of which are art, architecture, design, synthetic biology, genetics, and biocomputation. 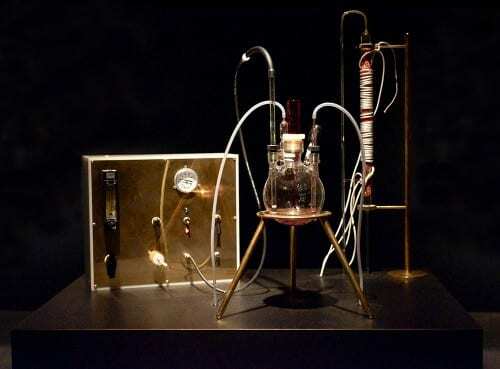 Adam Brown, The Great Work of the Metal Lover, 2012, glass alchemical bioreactor, gas manifold and gas tank filled with hydrogen and carbon dioxide, made in collaboration with Kazem Kashefi (artwork © Adam Brown; photograph provided by Beall Center for Art + Technology, University of California, Irvine). View of the alchemical installation. Camouflaged by both the seamlessness and user-friendly nature of biotechnology today, wetware is everywhere. The bio-performance art of Klaus Spiess and Lucie Strecker pivots on the hidden-in-plain-sight omnipresence of wetware. 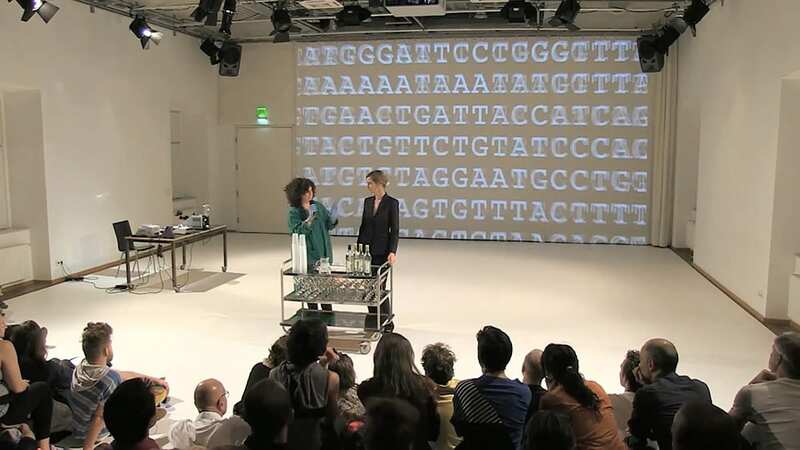 Installed in the exhibition as a single-channel video, Spit Party is a genetic performance project in which the two act out with an audience the process of home genetic testing known as “direct-to-consumer genetics” or DCG. The duo espouses “free speech and free spit,” inspiring interest in the audience to make their genetic information public as visual information. They distribute tubes and informed consent forms, asking for permission to harvest individual saliva samples, which are then visualized as large images of DNA bands. 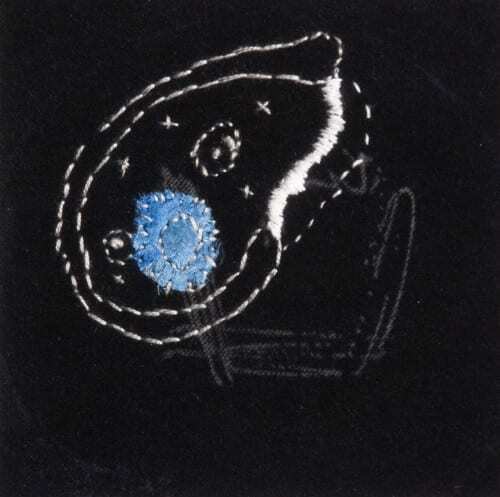 Participants are encouraged to interact with projected DNA images. Adam Brown, The Great Work of the Metal Lover, 2012, scanning electron microscope showing gold deposits produced by bacteria, twenty-four-karat gold leaf, made in collaboration with Kazem Kashefi (artwork © Adam Brown; photograph provided by Beall Center for Art + Technology, University of California, Irvine). View of image made with gold using a scanning electron microscope. Anthropologist of science Stefan Helmreich, whose thinking influenced the curators of Wetware, demarcates the ambiguous space of life with “limit biologies.”11 Limit biologies set in relief life in the extreme. They embody “a worry about ends” and an “argument from the future,” which above all else “point to larger instabilities in concepts of nature—organic, earthly, cosmic.”12 Helmreich’s three examples of limit biologies—artificial life, oceanic extremophiles, and astrobiology—inscribe the thresholds of biological life shaping the exhibition Wetware. 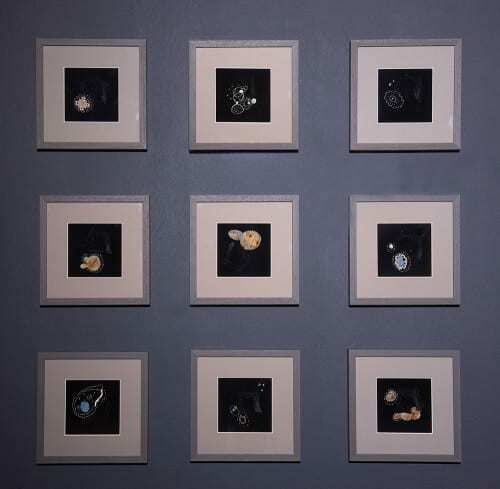 Gilberto Esparza’s work approximates Helmreich’s artificial life while bearing the mechanical trappings of artificial intelligence. 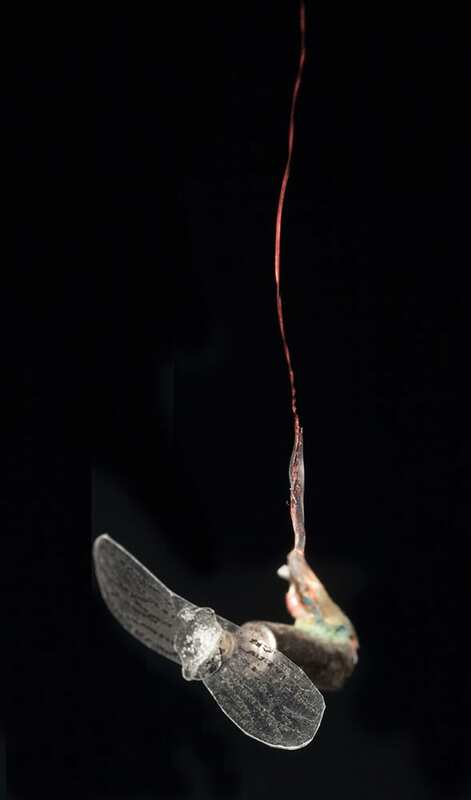 Esparza’s Pepenadores (Gleaners), made from recycled motors of toys, crawl amid mechanical detritus, while Moscas (Flies), mechanical insects made from discarded cell phone vibrators attached to invisible metal lines, zigzag above and around viewers’ heads. Adam Brown’s work catalyzes marine bacteria to create a natural element, deploying marine extremophiles—deep-sea bacterial life that defies all odds by living in hypersaline habitats, high pressures, and extreme temperatures. 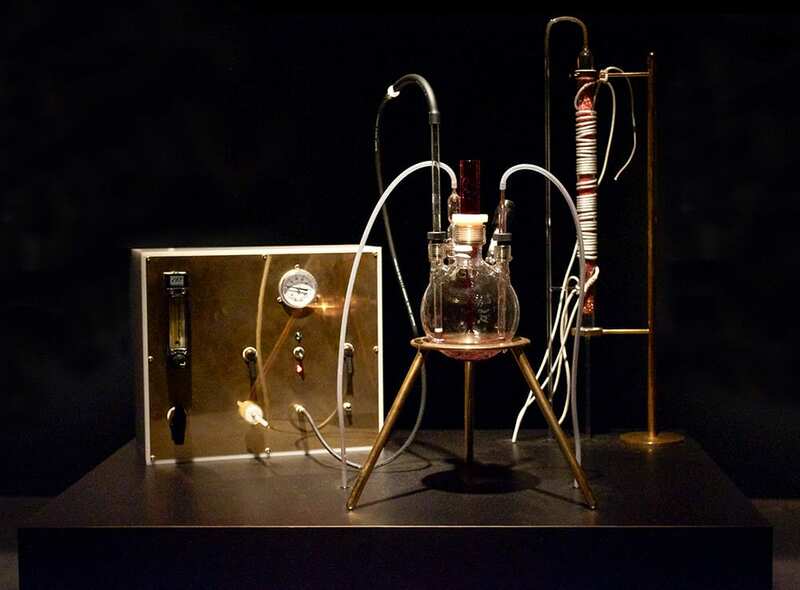 Brown’s The Great Work of the Metal Lover is an alchemical machine hosting the metallotolerant extremophilic bacterium Cupriavidus metallidurans that, under the engineered atmosphere created in the gallery, produces gold. Evelina Domnitch and Dmitry Gelfand’s Luminiferous Drift delves into astrobiology to ponder the signature of life as extraterrestrial. 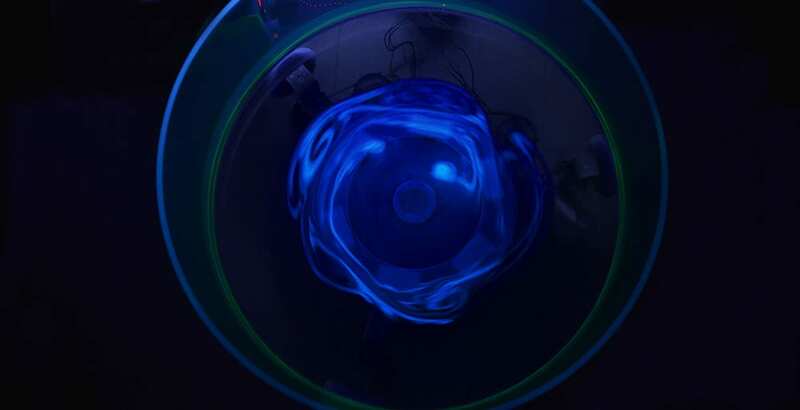 The viewer walks into a dark room cordoned off by black curtains and looks over a small whirling, circular bath of water in which primordial cellular conditions have been recreated. From nano- to meso-, the scales of life overlap and fuse. While the living matter within the works is often invisible to the bare eye, the works themselves—given full shape by various armatures, frames, podia, and mechanical contraptions—are at the scale of mid-size sculptures. The work in Wetware bears the intellectual and material challenges of high conceptualism and new media art. 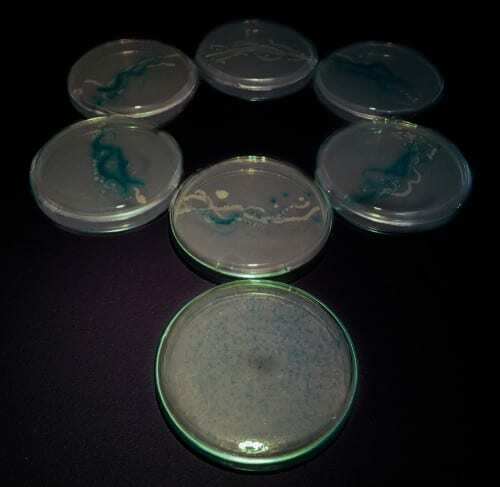 The work demands much scientific and technological knowledge on the part of its viewers, and an openness to the idea that machines and biotechnological effects (lab work involving enzymes, viruses, and genetic information) constitute a form of art. It would be remiss to understand Anna Dumitriu’s three projects in the exhibition—Engineered Antibody, Necklace, and Faster Mutation—solely in terms of how they look according to the leitmotifs of femininity and traditional women’s work. They are also fundamentally about her collaboration with scientists, a result of her residency working with researchers in the Liu Lab for Synthetic Evolution at the University of California, Irvine. Dumitriu’s Engineered Antibody looks like a colorful strand of beads atop a filigree of blue lace. 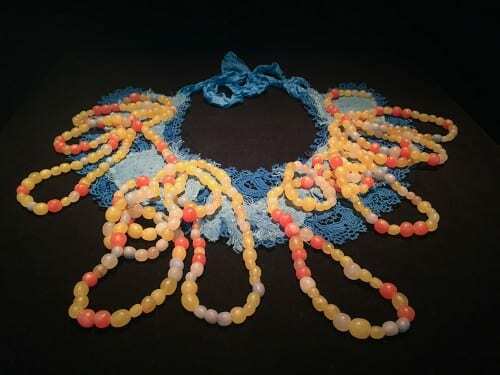 Its deeper meaning is woven into what it is: a necklace made up of 452 handmade beads containing the actual twenty-one amino acids of an antibody purified from the blood of an HIV positive patient. Living matter connects to language in that their biological stuff is connected to the metaphor that amino acids are the “beads of life”—the idea that scientists enlist to describe structures of proteins constructed from chains of amino acids. That said, the exhibition fortunately did not sacrifice aesthetic form and matter for an ethics of iconoclasm rooted in biotechnology. There were plenty of art cues in the form of shapes, sounds, and materials. Installers carefully positioned works on pedestals, scrupulously choreographed spaces, smartly painted the walls dark grey, and judiciously orchestrated lighting in the large exhibition space of the Beall. Aesthetics occupied a unique position here for, while the show was not concerned with connoisseurship or the classical delectation of beautiful objects, there was an intended and staged aesthesis—a bodily recognition of form and ideas—present throughout the entire exhibition space. 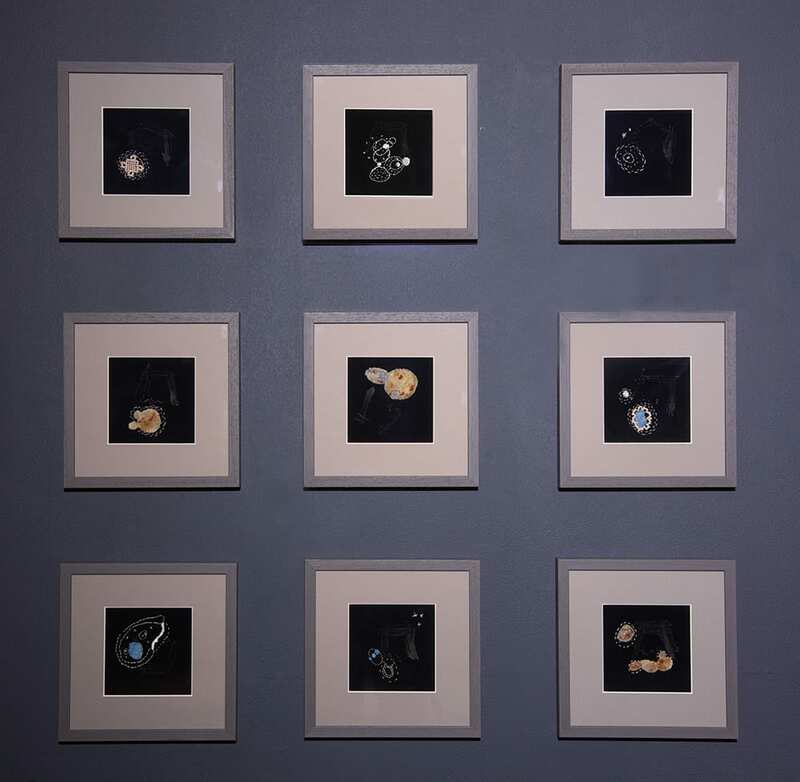 Each work triggered the deep-felt frisson that comes with the “aha” of new knowledge, scientific literacy, and making connections between art, science, and their shared history. This genre of work catalyzes the awe and wonder that comes with recognition of biological complexity that few other forms of art can. Charissa Terranova is associate professor of aesthetic studies at the University of Texas at Dallas, author of Art as Organism: Biology and the Evolution of the Digital Image (2016) and Automotive Prosthetic: Technological Mediation and the Car in Conceptual Art (2014), and coeditor (with Meredith Tromble) of The Routledge Companion to Biology in Art and Architecture (2016). She is the inaugural director and curator of Centraltrak: The UT Dallas Artists Residency, and regularly curates and writes art criticism. With Davidson College Professor of Biology Dave Wessner, in February 2016 she cocurated Gut Instinct: Art, Design, and the Microbiome, an online exhibition about art, the gut-brain axis, and gastrointestinal microbiome. 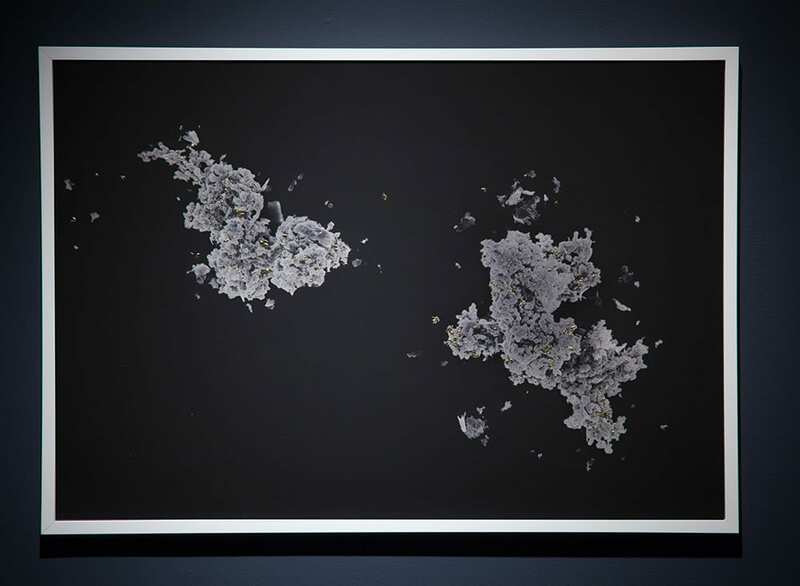 In the fall of 2015 at Gray Matters Gallery in Dallas, Texas Terranova curated Chirality: Defiant Mirror Images, an exhibition about art and the scientific concept of “chirality,” or non-superimposable mirror images.